A story of old-fashioned love overcoming circumstance with catchy tunes and moments of emotionally moving music amidst a background of well-crafted silliness. What else could you ask for? If, unusually, you answered this, unusual, rhetorical cliche by saying “a current justice of the supreme court,” then Washington National Opera managed this excellent and unique request for you on Saturday evening, in the opening performance of their production of Donizetti’s ‘The Daughter of the Regiment’ (La filled du régiment). 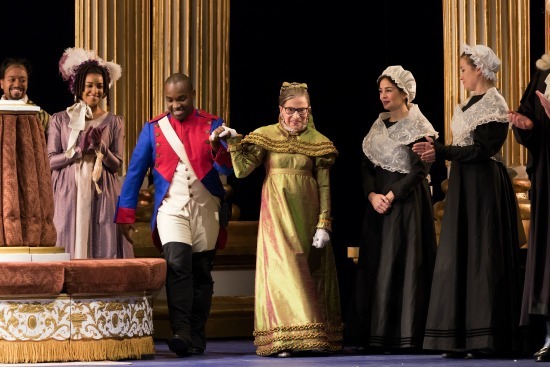 Though, sadly, Ruth Bader Ginsburg’s performance as matriarch Duchess of Krakenthorp was for one night only, I am sure her distinguished presence will continue to be felt, particularly in an opera in which the ideas of gender are so much at play. Marie, the canteen girl for the twenty-first regiment, was born to the sounds of battle. Adopted (by the whole regiment) as a baby, she considers her place to be the frontline and each soldier to be one of her many fathers. When Tonio, a local Tyrolean villager is discovered near the French Soldier’s camp, Marie comes to his rescue explaining he is not a spy but that he saved her life from an otherwise fatal fall. This, in turn, saves Tonio’s life, and the two fall in love. In order to ask for Marie’s hand, Tonio must defect and join the French regiment. While Marie’s fathers are initially reluctant to agree to Tonio’s plans for marriage they eventually give their consent. It is, however, too late. Marie has left the regiment with The Marquise of Berkenfield, who claims to be Marie’s aunt, though she is actually Marie’s mother. In the second half, the Marquise tries to change the ‘tomboy’ Marie into a ‘proper lady’ in order to protect her fortune by marrying the Duke of Krakenthorp. When the regiment arrives with Tonio, Marie’s mother must decide if Marie is allowed to marry Tonio for love or if she must marry the Duke for financial gain. Put simply, it worked brilliantly. It is in the second half that ‘Chief Justice’ Krakenthorp takes centre stage. Taking aim at some of the outdated ideas about women which are an unavoidable part of the opera’s narrative, Ginsburg’s Krakenthorp noted “the best of the house of Krakenthorp have open but not empty minds. The best are willing to listen and learn. No surprise, then, that the most valorous Krakenthorpians have been women.” Pointedly, and topically, she demands Marie’s birth certificate as evidence of her suitability, riffing on the ‘birther movement’, while warning “we must take precautions against fraudulent pretenders.” Chief Justice Ginsburg received a huge response from the audience, with several standing ovations through the evening, and one patron proudly wearing a “RBG votes for me” t-shirt. Something of the beautiful surreality of the production is heightened by Krakenthorp speaking English to The Marquise’ comically affected French. Put simply, it worked brilliantly. Lawrence Brownlee, who played Tonio on opening night (and is one of two singers undertaking the role) is simply outstanding. The opera’s notorious virtuosity comes from Tonio’s aria “Ah, mes amis,” which demands 9 high Cs. Brownlee executed them, and the aria, with an ease and energy that was thrilling, and his child-like enthusiasm throughout is addictive. Lisette Oropesa (one of two Maries performing the role during the production’s run) is equally strong, handling the wide dramatic range of the character from the comic music lesson, to the starkly beautiful “Par le rang et l’opulence” when left alone in the chateau. This moment is heightened by subtle and sensitive lighting shifts in Mark McCullough’s design. Oropesa’s control in her upper register is particularly dazzling. Deborah Nansteel is magnificent as The Marquise of Berkenfield, and Kevin Burdette displays his exquisite, nuanced comedic skills as Sulpice. Directed and choreographed with clarity and an admirable sense of fun by Robert Longbottom, he has brought a welcome vitality with him from his work on Broadway, which is a delight to watch. Never played for cheap laughs, Longbottom finds fun and funny moments in the opera’s simple structure to draw his audience in, and let them know they’re allowed to laugh at The Opera, too. James Noone’s set, from the Tyrolean fairytale-book first act to the grand mansion of the second, is magnificent. Zach Brown’s costumes are equally vibrant and detailed. Apart from the wonderful silliness, much of the opera relies on outdated ideas of femininity and feminine ‘roles,’ and Ginsburg’s involvement is a wonderful way of confronting these sometimes uncomfortable aspects for a contemporary audience, but we should also not be fooled into taking it all too seriously. After all, what is an opéra comique, without a bit of the ‘comique’? Running Time: Two hours and 15 minutes including one 25-minute intermission. “The Daughter of the Regiment” runs until November 20, 2016, at the John F. Kennedy Center for the Performing Arts. For more information click here.